This morning, BB flew to the tower and got the boy's attention, then proceeded to give a flying demonstration to her rapt audience of pefa kids. The Potter boys at UB are feeding themselves now, right now! While BB was finishing off the prey eating a legs, one of the kids grabbed the second leg from her and ran off with it! One of the boys is tearing apart this big chunk! A brother just grabbed what was left and ran away with it! Some shots of BB and her boys after the flying demo. 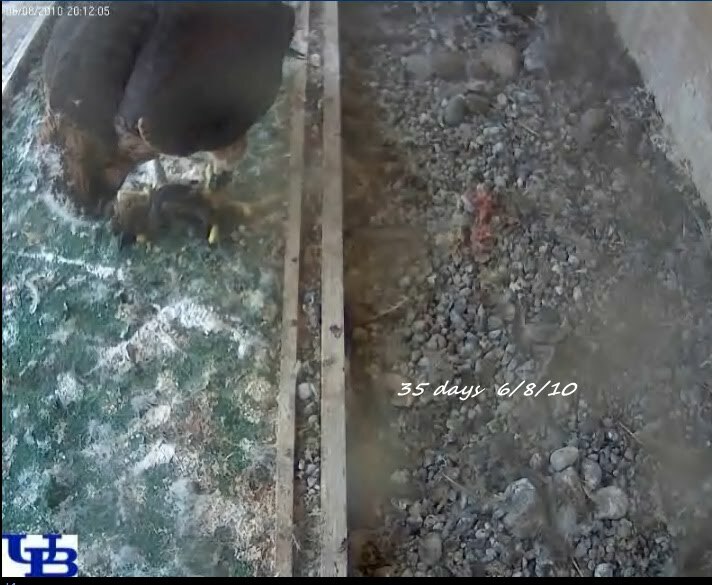 Parent on rail and at least two large chicks on the nestbox. We were watching from the Yacht Club and saw a man walking across the bridge above the nestbox. The two nervous parent pefas were flying circles over him. 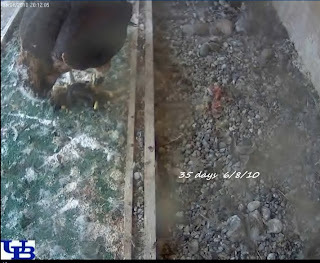 As he got a bit beyond the nestbox area, one pefa flew back to the box and landed on the rail, while the other parent continued to fly overhead. By the way, where are you getting the great camera shots from? Not from the webcam pics, but the ones from farther away?